Jason Concepcion: Every avenue of human endeavor has its “I could do that” avatars: individuals or groups whose success at a given craft appears so out of proportion with their technical abilities that it makes the entire undertaking seem somehow more accessible to the rest of us. More doable. Slacker and Clerks were “I could do that” movies. In music, you could point to the Ramones. Matthew Dellavedova is an “I could do that” NBA player. Delly seems as if he’s a second away from dribbling off his foot at all times. His jumpers often resemble the reflexive twitch of the muscles that happens when a person gets a wet willy. Those shots — shots that if you were playing at the park and Delly was on your team, you would apologize to your opponents for — somehow end up going in. Again, don’t question it. He threw, by my count, three lobs in Game 3, all of them bad. They were mistimed, poorly communicated, and off target. Two were tipped back to teammates, and the third was a late toss to LeBron on the break that he somehow dunked because he’s LeBron. Delly held Steph Curry to 36 percent shooting through three quarters. Dellavedova shot 4-of-6 on contested field goal attempts and 3-of-11 on uncontested field goal attempts, per NBA.com. Why? Because. The last of those contested shots came with less than three minutes left in the fourth, Cavs up by one, on a sequence in which Delly dribbled around a screen to the foul line with all the practiced grace of a newborn foal falling down an ice-glazed hill. The shot went in, plus the foul. 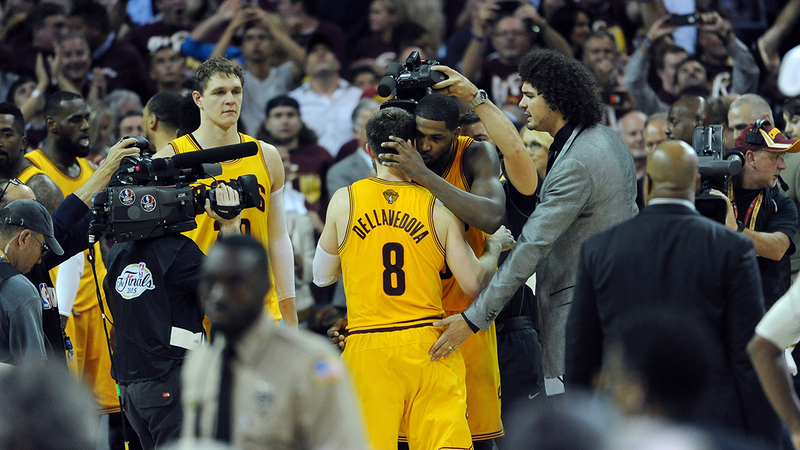 Matthew Dellavedova is touched. By the fates, by god, by luck, by forces beyond human understanding. Don’t question it. Just surrender to it. 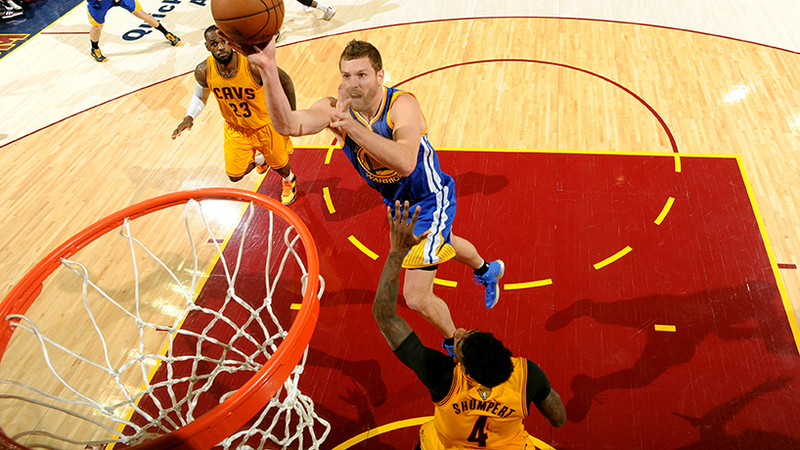 Kirk Goldsberry: Delly is the kind of guy that, if he’s on your team, you love him. If he’s not, you end up getting reconstructive knee surgery. LeBron James is averaging 41 points, 12 rebounds and 8.3 assists in the NBA Finals. That's crazy. Danny Chau: If there’s any cognitive dissonance in hearing the highest-paid Warrior up at the podium comparing himself favorably to James Jones, it’s all in our heads, not David Lee’s. This is a former low-tier star who earned $15 million this season, completely locked into his reality as an end-of-the-bench guy. But there was a reason why he was up there answering questions. He was nearly a hero. I wonder how much Lee has thought about this moment — and whether it would ever come — since the beginning of the season, when he was replaced by 25-year-old Draymond Green as the starting power forward of the Warriors. Green asserted himself as the emotional core of the Warriors. He’s loud, he’s brash, he’s passionate — everything he’s described as in that Beats commercial. But when you play up that role, you can’t just turn off that part of you. You are the open book so that no one else has to be. You are the main fire that keeps the many wicks alight. But Green was stifled last night, going 2-for-10, looking hesitant to shoot, getting stuffed on three occasions by a terrifying Cavs interior line, and jawing with the refs for most of his time on the floor. He was losing it — his poise, his ability to assess the floor clearly. He and Harrison Barnes shared a game-low plus-minus of minus-14. Steve Kerr couldn’t afford to have him on the court. What followed was miraculous: six minutes of Leandro Barbosa and Lee on the floor together, an unlikely tandem Pinky and the Brain–ing the Warriors back into the game before Stephen Curry finally found the lock combination to his reserve of illegal fireworks. Lee scored 11 points on perfect shooting from the floor, with four rebounds and two huge assists, all in 13 minutes. All in his first Finals appearance. “We’d talked all season about this,” Lee told ESPN’s J.A. Adande during the postgame press conference. “My job as a pro is to be ready.” He couldn’t have come up with a more clichéd response to his unexpected success, but that’s Lee in a nutshell. His presence, his words, his game, it’s all matter-of-fact. You know exactly what you’re getting from him. There isn’t another universe out there that could consider Lee’s ho-hum consistency anything close to a shot of adrenaline, and yet, here, in this one, with the Warriors on the brink of flaming out completely, that’s exactly what Lee was. If only it was enough. Can It Be That It Was All So Simple? Chris Ryan: Because Steve Kerr is playing every dude dressed in blue not named Justin or James, it’s become open season on second-guessing his rotations and five-man lineups. Play Lee, play Ezeli, leave Bogut at the airport, play Barbosa, no wait DON’T! Bench Barnes, start Iggy, did I mention play Lee? Here’s my bit of concern trolling masquerading as advice: Maybe get the ball out of Steph Curry’s hands. It’s not the shooting I mind. He showed at the end of the game that he’s capable of chucking out of a slump — those five fourth-quarter 3s tied him with Ray Allen for the most made in an NBA Finals quarter. It’s the passing that bothers me. There’s something wrong with the Warriors’ first-three-quarters-of-the-game offense in these Finals. They seem to be swinging from taking bad shots too early in the shot clock to passing up good shots late in the shot clock in order to get OK shots from cold shooters. Hi, Harrison. Curry is their point guard. He’s an unconventional point guard on an unconventional team, where everybody seems to be pretty good at everything, but he still has to go before the man if things aren’t ticking right. This isn’t a February night in Minnesota, or a May night in Houston. Cleveland is going all in, playing 28 Days Later defense. They are pressuring Curry high up the court, harassing him when he has the ball and denying him when he doesn’t. 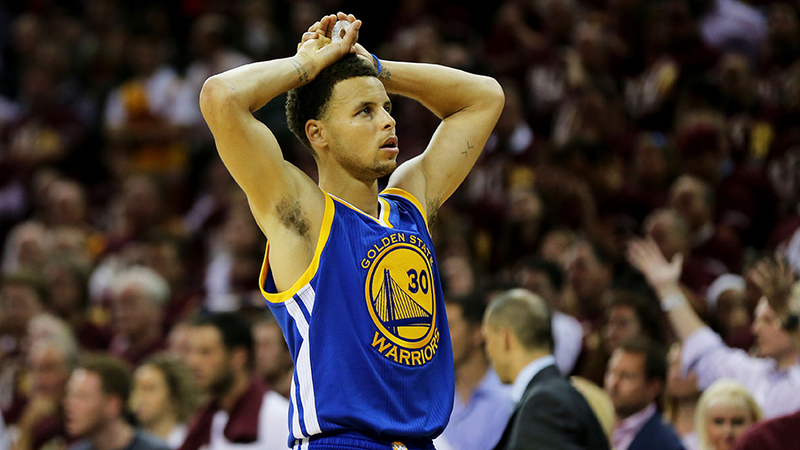 Right now, Curry is not an effective conductor of the Warriors’ offensive orchestra. He’s had six turnovers in each of the last two games, after averaging only 3.1 per game in the regular season. On Tuesday, he had as many turnovers as assists, including a boneheaded behind-the-back pass, with 2:04 left in the game, that missed Draymond Green by about 10 feet and acted as a reverse dagger. Not even his long-range shooting heroics could stop the bleeding. When the Warriors got back into the game in the fourth, it was because they were making the smart extra pass, not the perfunctory extra pass — like they do so often when driving the lane (seriously: Screw value, and just take the 2). That’s the good news. The bad news? The offense seemed to flow better through David Lee than it did through their MVP point guard. Curry’s shooting will fix itself. If I were Kerr, I’d be more worried about the passing. Did Somebody Order King’s Blood? We continue to clown David Blatt, yet he's sent home Stevens, Thibodeau and Budenholzer. If Kerr doesn't come up with an answer, he's next. He’s out here playin’ with the boys. He’s in a 4G dive inverted with an MiG-28, and he and Delly are keeping up foreign relations. Yeah, Ice. Man. That’s right — he is dangerous. But I see some real genius in his flying. He’s taking on bogeys on all sides, he’s hitting the brakes, and the Warriors are flying right into Timofey Mozgov. Let me ask you this: If you were going to war, would you want David Blatt with you? Hey Dave, if Ty Lue goes elsewhere this summer, gimme a call. I’ll fly with you. Two wins down. Two to go. Time to lock in.